Recado rojo or achiote paste is a popular blend of spices. 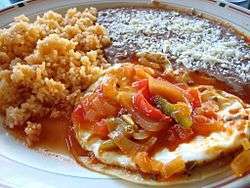 It is now strongly associated with the Mexican and Belizean cuisines, especially of Yucatán and Oaxaca. 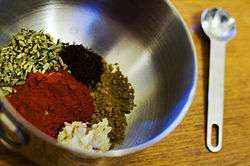 The spice mixture usually includes annatto, oregano, cumin, clove, cinnamon, black pepper, allspice, garlic, and salt. The annatto seeds dye the mixture red, and impart a distinctive red-orange color to the food. The paste is dissolved in either lemon juice, water, oil, or vinegar, used as a marinade for meat, or rubbed directly upon it. The meat is then grilled, baked, barbecued, or broiled. Sometimes, it is added to corn dough to create a zesty flavor and color in empanadas and red tamales. A similar condiment, called sazón ("seasoning"), is commonly used in the cuisine of Puerto Rico for meats and fish. It is made from annatto seeds ground with cumin, coriander, garlic powder, and salt. ↑ McGee, Harold (2004). On food and cooking: the science and lore of the kitchen. New York, NY: Scribner. p. 398. ISBN 0-684-80001-2. Retrieved 26 December 2011. ↑ Bayless, Rick & Deann Groen (2007). Authentic Mexican: Regional Cooking from the Heart of Mexico. New York, NY: William Morrow/HarperCollins Publishers. pp. 65–67. ISBN 0-06-137326-5. Retrieved 26 December 2011.